Adventure RPG with tactical turn-based battles unfolding in a fairytale fantasy world of fearless knights, evil mages, wise kings and beautiful princesses. The player leads their character through the game world; exploring it; commanding armies in battle; and completing required and bonus quests. Sequel to the critically acclaimed King’s Bounty: The Legend. Players will take on the role of Princess Amelie who travels around the world of Teana and searches for the renowned knight, and her mentor, Bill Gilbert. 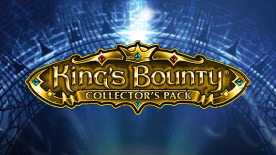 Expansion for the famous King's Bounty: Armored Princess role-playing game. Includes the “Orcs on the March” expansion, the two new independent campaigns “Champion of the Arena” and “Defender of the Crown” and a convenient editor with help system. A new hero, young Olaf, the son of the Northling Kingis dedicating his life to the fight against the undead infesting the Northern Lands of Endoria. He will face epic battles, valor and love. Olaf is accompanied by gorgeous Valkyries who will assist him on the battlefield.